This three day workshop provides an in-depth and intense exposure to all aspects of cold process soap making. You will begin with the basics and build a group of competencies enabling the production of multiple soaps across a broad group of options. How to use lye safely and with confidence is an integral part of the workshop. By the end of day three you will be formulating your own unique soaps for whatever purpose meets your individual needs. You will leave with an understanding of the characteristics of the major soap producing fats, oils, and butters and how they work together to produce soap with any given set of useful or beneficial soap qualities. The main difference between the one and three day workshops is the emphasis on YOU and learning to create recipes that are what you desire to make. Due to the limited time, participants in the one day class make one batch of soap (100% olive oil), not several. Through demonstration and individual soap production using from one to six soap oils, fats, or butters, you will learn how to evaluate soap formulas with understanding. You will leave the class “free” from a dependence on “Cookbook” soap recipes from the internet, colorful coffee table soap books, or ordinary soap making primers. Don’t forget the stash of soap you will have made by your own hands, too! Cold process soap making is the old-fashioned process that combines sodium hydroxide with fats and oils, and creates a soap that cleans with kindness due to the glycerine created and retained in the soap. We do not teach ‘melt and pour’ glycerine soapcrafting or hot process soap in this workshop. The workshop fee includes class lecture, demonstration & production time from 9:30am through 4:30pm on Day 1 and 2, and complete between 2:00 and 3:00pm on Day 3. Lunch, beverages and snacks; all supplies and materials needed for class (fats, oils, butters, milks, lye, fragrances, safety goggles, gloves, aprons, and soap molds to take your soap home) and the Workshop Workbook including classroom lecture notes, helpful online resources, and recommended soap making suppliers. A tour of Soap Shed production areas, soap molds, drying racks, cutting, packaging, retail customer shop, and shipping areas will be provided over the three days. Please Note:We do not teach ‘melt and pour’ glycerine soapcrafting or hot process soap in this workshop. • What’s needed to make soap? • The drying and “curing” of soap.....where and for how long? 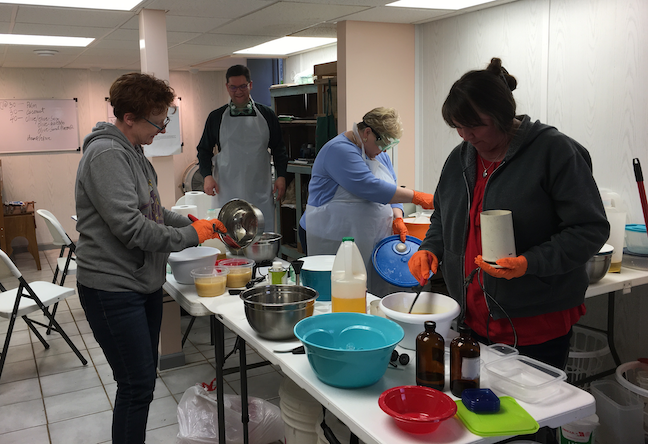 This session will build on the basics of day one with your making of a multi-oil soap, the introduction of making milk soaps, incorporation of butters, further development of your own formulas, and your making a batch of milk soap at the end of the day. This session will continue to build on the previous two days. You will observe and evaluate soaps made so far with an eye towards the future. You will move from a set, predetermined formula to your own, designed with a specific personal perspective. You will make your creation come alive. You will compare and contrast among other soaps made in the class, various recipe soaps available from the Soap Shed, and conclude with a tour and discussion of all soap operations at the Soap Shed. Tour of the Soap Shed facilities and operation from manufacturing to retail sales will be provided over the three days of class. The ‘classroom’ part of Day 3 is over between 2:00 and 3:00 pm (depending on questions). We will provide all Supplies and Materials you need for the workshops, including safety goggles, gloves, aprons and molds. Please wear old clothes so if you splatter olive oil or butters on them, you won’t be heartbroken. Long sleeve shirts and full leg length pants protect your bare skin from lye spills, so please bring them. Each participant will receive a notebook with written material on each topic we cover, along with supplier information and recipes to get you started. And if you don't understand why a liability waiver is needed when visitors are allowed around sodium hydroxide or lye, well, that's one of the reasons you need this workshop before you make soap on your own! Available dates are listed below for you to select from. If you select a workshop that states 'Waiting List Only' you will be added to the waiting list for the workshop scheduled for that date, and contacted if anyone drops out. All Day 9:30am – 4:30pm on Day 1 and 2; Completion at 2:00 on Day 3. Tim Tyndall started making cold process soap in 1998, and is a science professor by education and training, having been a science teacher and college administrator for 30 years in chemistry, biology, botany and health sciences. 'Dr.T' has been teaching handmade soapmaking weekend classes and week long classes at the John C Campbell Folk School in Brasstown, NC since 2001. Their unusual backgrounds - combined with their first hand experience in creating and running a handmade soap business for 20 successful years - provide Tim and Karen with unique perspectives on making and selling handmade soap. We prefer no more than six participants in each workshop, and need at least three participants for each workshop to be a ‘GO’. Please feel free to contact us at 877-404-SOAP with any questions you have. And please read our cancellation policy below before signing up. Our workshops are planned for small groups of 4-5 participants, and often require us to turn away additional participants when the workshops fill. Should you need to cancel your attendance - for any reason - please let us know as soon as possible. If we can fill your space prior to 7 days before the workshop, you will receive a refund of your payment minus a $45 non-refundable deposit. If we cannot fill your space at that point, you will receive half of your original payment in the form of a refund check. If you give us less than 7 days notice or just don’t show up for the workshop(s), no refund or credit will be given. You are welcome to send someone else in your place if you cannot attend yourself.